looks so beautiful when sleeping, doesn't she? Unfortunately, she only sleeps for 45 minutes to one hour before she wakes up. I'm not talking about just for naps, this is at night time too. Honestly, it wouldn't be that big of a deal except I feel bad for her as I know her body needs more sleep. Also I am missing my husband at night after the kids go to bed. Since one of us is constantly working to get Meridian back to sleep after she wakes up after the first 45 minutes to an hour, we don't get time together. Also, the girls share a room and Miss Meridian is waking up her big sister. Not something any of us enjoy as it makes for a crabby little girl the next day. So, any advice blog readers? Have any of you dealt with this with your little ones? If so, how did you get through it? Have you tried letting her cry it out? With one of our children in particular we had to let him cry it out because he was waking for no apparent reason just like Meridian. He loved to be held and I think warm in our arms. He was 7 months old and I couldn't handle being up with him all the time. So after much discussion and hearing Focus on the Family broadcasts on the matter and being in Growing Kids, Daddy took the older sibling (baby's roommate) and slept in another room while we let the baby cry it out. The first night he cried for 5 hours. Torture! I sat by the door the entire time and listened to make sure he was ok (I tried to read) Once every 30 minutes to an hour I would go in and pat him on the back telling him it was ok, so he didn't think he was abandoned -- but I wouldn't pick him up. The 2nd night he cried for two hours. The 3rd night he cried for 15 minutes. After that we never had issues again. One other thing I did was raise the head of the crib or just mattress up an inch or two for all my babies so they slept with their upper body slightly elevated. Angie, we haven't tried letting her cry it out. To be honest, I don't think I could do it and I know for sure Chris could not. The mommy heart in me would just break. I do think though that some of Meridian's issues have been because she likes to be held. Chris tends to like to snuggle and rock her to sleep which is so sweet of him, but it does kind of mess things up for me when I am trying to lay her down quickly for naps. He is now working on getting her to lay down awake but sleepy. I forgot that I was going to also say that another reason we didn't/haven't done CIO (cry it out) is because I was suspecting acid reflux in her. I know that if you let them cry when they have acid reflux, it can make it worse. Letting him CIO wasn't an easy decision by any means. We discussed it for weeks. Lance and I finally decided to give it a try because I was sooo tired and crabby because I needed more sleep to function properly as a mom and he needed sleep to function at work. After the first night I almost decided to give up, but I remembered the broadcast on Focus on the Family saying it could take up to a week -- the older they are the longer it takes. I was ecstatic when the third night it was only 15 minutes and then he was sleeping through the night. Praise God and Hallelujah, what a refreshing feeling that was! It is painful to hear them cry, but the benefits outweighed the crying and were by far better for the whole family. Why do you think it could be acid reflux? Is she spitting up a lot? Irritated during her feedings? Hiccup or cough a lot? I would think that she would be incredibly fussy during the day if it was acid reflux. Praying for you my friend. :) Love ya! Thanks Angie for your insight! If we decide to go that route, it would definitely have to be after much prayer. Oh and I hear you on needing to be a better mom with needing sleep. That is a concern of mine for sure. I was thinking reflux because she is a major spitty baby and she also is not the best nurser. Lots of popping on and off. She isn't a fussy baby, but I guess (from reading on it), there is such a thing as a "happy" spitter (reflux) baby. Praying for God's direction there because we do have meds now and were giving them to her, but I'm not real comfortable with that either. Hey Vanessa - I just wanted to add that both of our kiddos have been big refluxers - of the happy variety. Elevating the bed is a great trick. With Josiah we actually would sometimes just put his carseat in his crib. 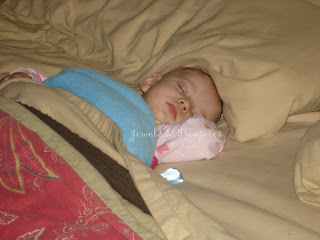 Then we graduated him to just the elevated bed - at naps we would prop him with the boppy pillow holding him up. The doc had us mixing cereal into his milk and this did wonders for him (and helped him sleep with a full tummy). With Eden, due to all the new crazy 'guidelines' about putting kids to bed, we don't have anything in her bed (no elevated positioner, no boppy) - but have elevated the head of her bassinet. For naps we sometimes let her sleep in her papasan chair (which is obviously elevated). Thanks Tami for your thoughts. I really appreciate hearing other experiences. Oddly enough, this week she started napping on her own 2-3 hours 2 times a day. I'm not sure where it came from, but I am enjoying it. The only struggle we are still having now, is she is fighting going down to sleep. I'm not liking that and still trying to figure out how to get past that. I actually took her off the reflux meds because I didn't think it was helping and that is when she finally started sleeping (go figure, right?). Question though-what meds were/are your kids on? We were trying Zantac and I don't think it worked at all. But I'm hesitant to try anything else as she is sleeping now. I don't know though-there is still a part of me that thinks it is/was reflux. Sigh..sometimes being a parent is hard.